We are glad you choose us as your online CE provider. 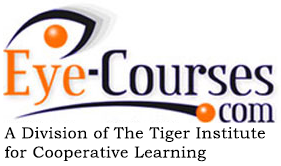 At Eye-Courses.com, we value your business and always strive to provide quality education on your own time, at your own pace, and without the hassle of travel. If you have any questions or concerns that we can help with, please use the “Contact” tab on the homepage to reach out to us. You will always be answered in a timely and professional manner. One of the main questions new users may have is, “Will I always have access to CE certificates for courses I have passed?” The answer is yes. Once you have created an account, that account is yours and holds all of the courses you have purchased and passed. Your account will also hold all of your CE certificates for CE approved courses you have passed and can be printed at any time. How do I become certified? The best advice we can give you is if you have the opportunity, always become a certified assistant/technician. Be proud of your profession and the medical field you represent. In regards to how to become certified, use the links below to better understand the different certifications, who the governing body is, and what are the necessary steps for the certification that is right for you. Are you interested in authoring a course or submitting a course you have already created on Eye-Courses.com? We are always looking for new content and allowing our users to participate in future content and courses is what we are all about. Use the “Contact” tab on the homepage to let us know of your interest. We will contact you as soon as possible to discuss the opportunity! !